Alien Nation, 2017. Hirshhorn Museum and Sculpture Garden. HOESY CORONA takes a multimedia approach to art-making. His complex performance works, which involve movement, costume, light and sound, balance alienation with celebration. 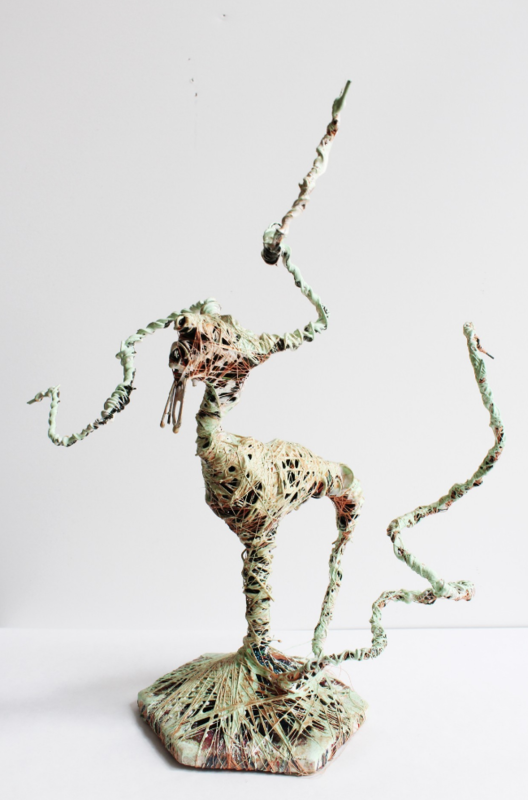 His sculptural works explore the role of scapegoating in maintaining cultural dominance. Concerned with a queerness, immigration and climate change, he explores the many forms of marginalization in North American society. Hoesy earned his BFA at The Maryland Institute College of Art in 2009 and is currently a MAT candiate. He has exhibited at The Hirshhorn Museum and Sculpture Garden, The Baltimore Museum of Art, The Walters Art Museum and The Peale Museum, among numerous others. In 2017, he received an Andy Warhol Foundation Grit Fund Grant and, in 2016, a Ruby’s Project Grant in Visual Arts. He is a 2017-2018 Halcyon Arts Lab Fellow, as well as an Artist-in Residence at the Fillmore School Studio in Washington, D.C. Hoesy lives and works in Washington, D.C. and Baltimore, Maryland. OtherPeoplesPixels: Costumes that obscure the identity of the wearer feature prominently in your performance work, especially The Nobodies (2009-present). Who are The Nobodies? 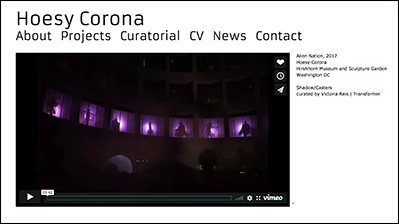 Hoesy Corona: The Nobodies are no one and everyone at once. In this series I consider what it means to be a disenfranchised member of society in North America by embodying the abstract concept of nobody, nothing all of a sudden becomes individualized, becomes body and eyes, becomes no one. I started this series after reading The Labyrinth of Solitude by Octavio Paz in which he describes the fraught psyches in the relationship between Mexico and The United States in detail. As a Mexican immigrant artist living in the U.S. for most of my life, I consider the paradox of the simultaneous visibility and invisibility of the immigrant in the U.S. In this series I invite audience members to participate in the act of nobodying, an operation that consists of making somebody into nobody. OPP: Can you talk about the materials you use to construct the wearable sculptures? HC: I use a variety of familiar everyday materials to construct these wearable sculptures. When I started the series in 2009, I was working as a florist and was drawn to discarded floral packaging materials—cellophane, ribbons, mylar, silk florals, and mesh nettings—and collected them obsessively. Once I had amassed a substantial amount of stuff, I then transformed the materials into other-worldly colorful wearable sculptures that accompanied a live performance. I no longer work as a florist, but I am still interested in using different types of plastics as well as wigs, silk flowers, lights, clear film, and adhesive vinyls to construct new Nobodies. OPP: What kinds of movements do the Nobodies perform in public spaces? HC: The movements in the Nobodies are very subtle and sculptural. Oftentimes, viewers don’t realize that the sculptures are being animated by real people. The slow movements invite the audience members to pause as they consider the situation before them. In public spaces these performances are particularly poignant as the unsuspecting viewers encounter the Nobodies in their natural setting. 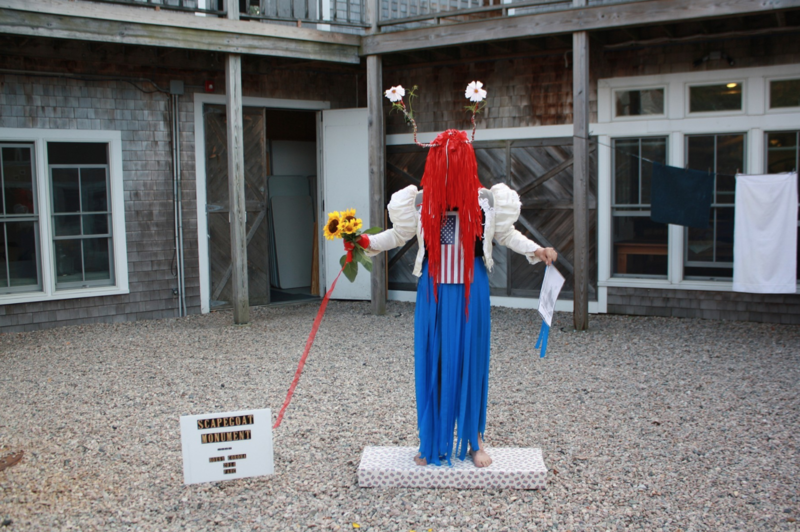 OPP: The Scapegoats show up both as static sculptures—some life sized and some tiny—and performance characters. Do you see one iteration as more successful than the other? How do they work differently on the audience? HC: I often intertwine the archetype of the scapegoat as a way to have us visualize the strategic selection of somebody, made into nobody, for the supposed wellbeing of the group. The sculptural forms don’t always involve a live performance, but are still performative in their context. In Scapegoat Thrones, for instance, I use found chair structures as the base of each sculpture and ask audience members to consider the cost of the comfort that is afforded to them in the world. So while there is no live performance involved, the audience can still imagine themselves in relation to the chair forms. Most recently during a residency at Ox-Bow School of Art, I worked in the ceramic studio to construct miniature Scapegoat Idols that can be handled by audience members. My hope is that one day each person in the US will have their own Scapegoat Idol that they can use to liberate themselves from negative feelings of blame and shame. OPP: Tell us about Alien Nation (2017) at the Hirschhorn Museum in Washington D.C.
HC: Alien Nation, curated by Victoria Reis at The Smithsonian Hirshhorn Museum and Sculpture Garden, was my most ambitious site specific performance to date. It included with 24 performers and two musicians. This mysterious and surprising shadow casting performance originated in response to the unique circular architecture of the museum. I knew I wanted to do something of a global scale that implicated a broad audience and included as many people as possible, so I conceived the idea of climate induced migration as a very real issue of our time that needs to be voiced. OPP: The piece was viewable from the inside and from the outside. . . how were the viewing experiences different? HC: Although the museum was open late and visitors had the opportunity to sneak a peek of the performers on the second floor rotunda, most of the 1,200 audience members were patiently waiting outside around the fountain for the performance to begin as intended. 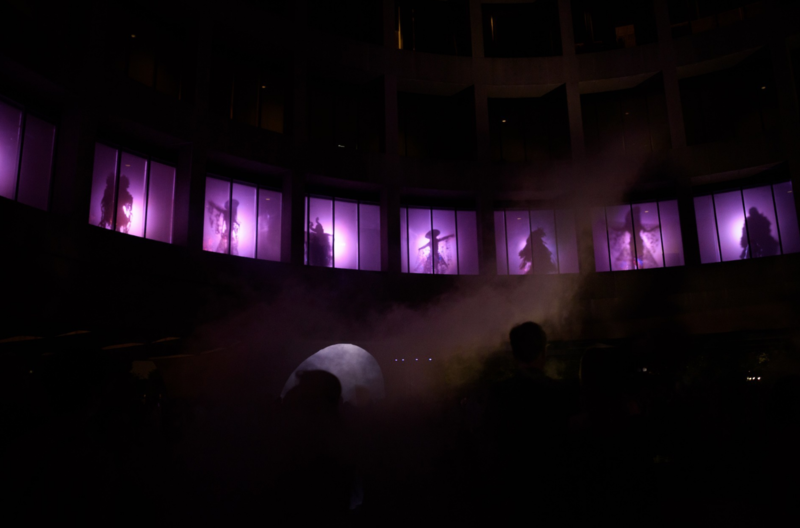 Once outside, audience members saw 24 climate-immigrants backlit with purple light creating mysterious and surprising shadows in each of the 24 windows on the second floor rotunda. 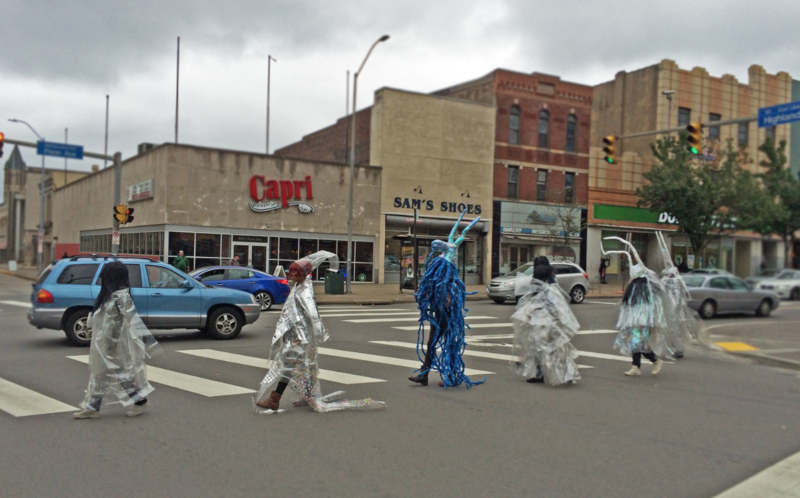 The 24 performers wore what I call “climate ponchos,” which included head gear that obscured the performers faces, an approach I chose because of the mystery and anonymity it afforded. Always silent these figures created subtle, sculptural movements in various locations that were complemented by live drumming juxtaposed with natural foley sounds that included ice-cracking, loons, and running water. Slowly over the course of the performance the Climate-Immigrants started to descend downstairs and continued on their journey through the sea of bodies. The clear wearable climate ponchos were adorned with images that depicted the archetype of the Traveler, with the people depicted wearing backpacks, carrying suitcases, wearing hats and some holding children. They were all on their way somewhere, in one direction a lot of the times. This simple showing of people in movement, in transition, resonates with a world-wide issue and echoed the reality of the viewers as they themselves traversed space to witness the performance. Alien Nation, 2017. Video documentation of performance. OPP: In the Fall of 2017, you began a Fellowship at the Halcyon Arts Lab. Tell us bit about the program and your experience. How did it change your work? HC: Halcyon Arts Lab is a fully funded, nine-month, international incubator that nurtures socially engaged artists in Washington D.C. I was lucky enough to be selected as one of 8 fellows for the inaugural cohort 2017-2018 to continue my work on Alien Nation. The program includes a range of professional development opportunities as well as tons of studio visits from renowned arts professionals. In addition, I am being mentored by Alberto Fierro Garza, Director of The Mexican Cultural Institute of Washington D.C. and mentoring a young artist myself. In the short seven months that I’ve been here, my practice has strengthen by leaps and bounds, I suspect this has everything to do with the nurturing environment the fellowship provides. I encourage all socially engaged artists to keep an eye on this fellowship and consider applying in the years to come! To see more of Hoesy's work, please visit hoesycorona.com. Featured Artist Interviews are conducted by Chicago-based artist Stacia Yeapanis. When she’s not writing for OPP, Stacia explores the relationship between repetition, desire and impermanence in cross-stitch embroideries, remix video, collage and impermanent installations. She is an Adjunct Assistant Professor in the Department of Fiber and Material Studies at The School of the Art Institute of Chicago, where received her MFA in 2006 Stacia was a 2011-2012 Artist-in-Residence at BOLT in Chicago. Her solo exhibitions include shows at Siena Heights University (Michigan 2013), Heaven Gallery (Chicago 2014), the Annex Gallery at Lillstreet Art Center (Chicago 2014), The Stolbun Collection (Chicago 2017) and Indianapolis Art Center. Where Do We Go From Here? just closed at Robert F. DeCaprio Art Gallery (Palos Hills, Illinois). In conjunction with this improvised installation, Stacia invited eight OPP artists—Kathryn Trumbull Fimreite, Brent Fogt, Melinda Thorpe Gordon, Jaclyn Jacunski, Jenny Kendler, Meg Leary, Geoffry Smalley and Erin Washington—to respond to the text "Where Do We Go From Here?" Each artist approached the question from a different angle, emphasizing that both the We and the Here are not the same for each of us. For Chicago Artist Coalition's annual benefit Work in Progress, Stacia will create a one-night installation that solicits the help of benefit attendees.